Filmed a review of Trello, the online cloud tool that’s been taking the place of my DM Journal bit by bit. This isn’t sponsored, just wanted to share it with my fav people. SOOO guess what!? David T… that guy who makes amazing book reivews, he helped me clean up the presentation, and I think it’s looking alot sharper. Huge thanks to @Dave_Thaumavore you are a Solid Bro! So true story… out of the two review videos i put out this week… i recorded 10. I wish I was making that up, but I had technical problems on a bunch of them, and then keep finding a better “look” and wanted to do it better… you would think that would be frustrating as hell, but honestly, I really loved the process. I feel like after getting that much practiced this week, I’m getting much more comfortable with talking to myself. I also think i’m saying “um” and “like” alot less too, which use to bother me after i’d watch a recording. I’ll keep practicing and building on it, the world needs more ICRPG damn it! Seems neat… couldnt finish the vid atm… maybe u answered it but do u use it in game and if so how do u find it to work for u? Thanks for sharing! I’ll be sure to check it out later today. Thanks a lot for this tip! That will become my new goto Tool for planing. I work in IT at a small University in Kirkland Wa. We have been using Trello for years. BaseCamp is the product that they sell and Trello was taken up as a project seeing the need to replace Excel. Why Excel? Turns out that most users don’t use Excel to do math (what it was designed to do) however they use the columns and rows to make lists. So bam! Trello! We manage a lot of work projects, student worker hours, lunches, wish lists etc. Personally I use it for Menus, Shopping lists, personal projects. It also makes a great outline tool for writing. Great review and a great idea as a DM Journal! Yes, I use it while we are playing, it makes it easy for me to track to information, and to zoom in and zoom out on details as needed! It’s funny you say that, I stumbled on the DnD Beyond developer roadmap on youtube, not something I normally look at, but to my surprise, they where using Trillo to track and plan all their development work! I am big fan of Trello. 100% agree it is a powerful tool for any GM. Ironic timing on this post as just last night I discovered it and today began populating it. From what I can tell so far… this will be a great tool and allow me to go digital at the table more completely. I’m so tired of printing and cutting and pasting etc. Hell… just all the writing I have done to transfer information into my “GM’s tome” if you will has been exhausting and never ending. I work in IT at a small University in Kirkland Wa. We have been using Trello for years. I do a lot of IT project management myself and we just tested Trello and a few other apps last Fall (2018). We liked Trello a lot as a team, but we actually decided on Notion instead. It’s similar to Trello in many ways but it added a little more functionality that we wanted like a customized database and Kanban boards. Like Trello it too worked on multiple platforms and mobile devices. Once I saw @Jason_Scranton use Trello this way I created a free personal Notion account and had my fellow players join in. We use it similar to the way Jason demonstrates with the Kanban board block, but we’ve also used the calendar block for scheduling games, I can share wiki pages with session logs and “codified house rules”, and we’ve used the spreadsheet blocks for character sheets and the database blocks for keeping game data (i.e. Mainframe 36: Math, Science, and YOUR game). Thanks Jason for the inspiration! Holy smokes, this is a very cool tool! I wonder how far I can get on the 1000 blocks for the free version, but I’m going to give this a try too. Supporting db content is a big deal, oh the many thousands upon thousands of tables that could be built there. Then within each card, I write out my notes which could include the area’s DEW or TTT, which I remember with the phrase DEW-T3 (It is my duty to include these things). I also include any LOOT I want to hand out, stats for monsters, Monster AI charts, and etc… I even include Heart emojis for monsters and other challenges. I like Trello because it focuses me on on one area at a time and when I’m out and about I can easily add a comment to any of the cards with my phone so I can include those too in the session. Great review and great program! I’ve only been playing with it for a few minutes and can see how it will change my GMing! This might even be a great way to preload published adventures so that everything is right at your fingertips. Thats what i have done with „Beneath the Door“. I made Lists for Places, NPCs, Things to find, the story, the hook scenes and so on. then i GM online and it was so easy. Nice Tool! I also use it for gathering ideas with my players. Actually i have two boards open for two different groups for doing world building together. We start with a GO and a NO GO List. So everyone can just fill in what should be in the gameworld and what not. Tonight we meet up and try to get a playable background out of this. Hail and well met! 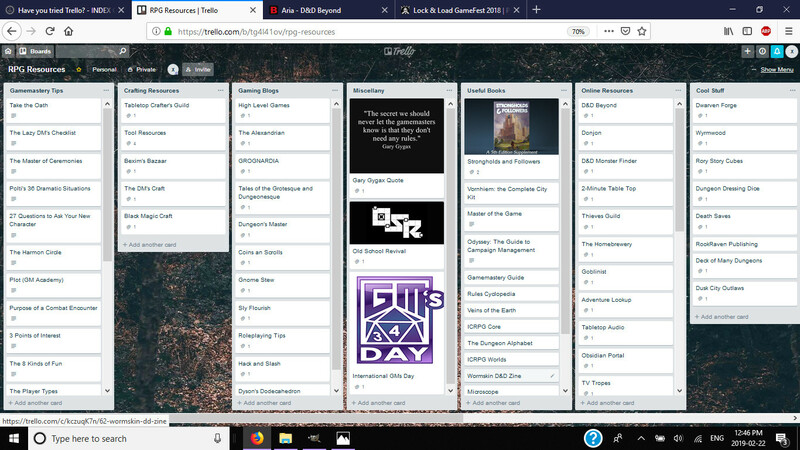 Just wanted to chime in and say that Trello is a fantastic tool that has been an absolute boon for my gaming life. No more random notes scribbled across several different notebooks for me! While I have an absolutely massive GM Binder filled with many memories, I have taken the leap and made the change to a fully digital version and Trello works wonders.